Diamante, a dazzling and contemporary collection of hand cut crystal. Set with Swarovski crystals. 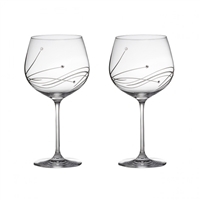 Pair British hand cut Swarovski crystal 24% lead crystal large wine glasses. Diamante range set with Swarovski crystal by Royal Scot Crystal. Presentation boxed. Pair British hand cut Swarovski crystal 24% lead crystal wine goblets. Diamante range set with Swarovski crystal by Royal Scot Crystal. Presentation boxed. Pair British hand cut Swarovski crystal 24% lead crystal Champagne flute glasses. Diamante range set with Swarovski crystal by Royal Scot Crystal. Presentation boxed. Pair British hand cut Swarovski crystal 24% lead crystal cocktail, martini or Champagne glasses. Diamante range set with Swarovski crystal by Royal Scot Crystal. Presentation boxed. Pair British hand cut Swarovski crystal 24% lead crystal gin and tonic copa cocktail glasses. Diamante range set with Swarovski crystal by Royal Scot Crystal. Presentation boxed. 24% hand cut lead crystal teardrop vase. Diamante design with Swarovski crystals. Gift boxed by Royal Scot Crystal. 24% hand cut lead crystal urn style vase. Diamante design with Swarovski crystals. Gift boxed by Royal Scot Crystal.